The below problems are in the changer that we have repaired for others. Grinding noise every time start the vehicle. Pull out the ashtray insert and remove the screw behind it. 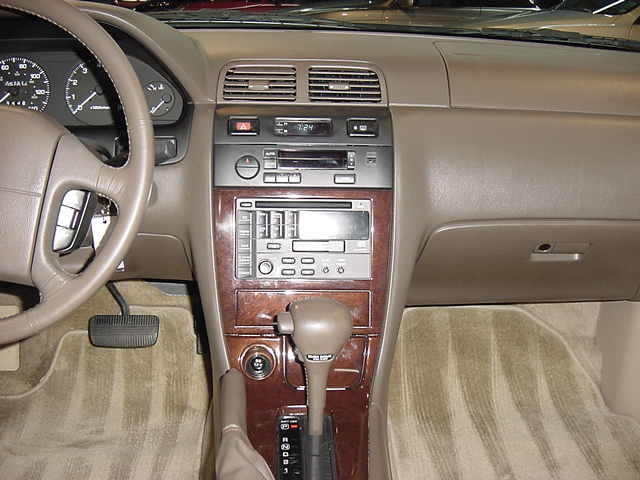 The portion of the dash that comes from below the ashtray and goes around the shifter will come up and off from around the shifter, carefully use a regular screwdriver and pry it up. Unplug the connectors to it and move it from around the shifter. The air vents above the stereo will pop out by working around the edge with a regular screwdriver, carefully working it until it pops loose. 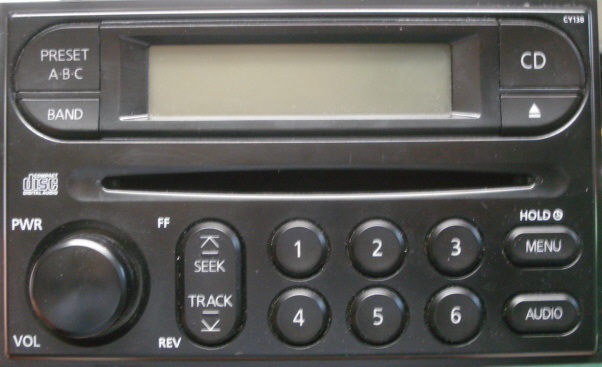 Once the top portion and the bottom portion have been moved, you can see the 2 bolts on the top and bottom, remove them and the stereo and TEMP controls all come forward together. 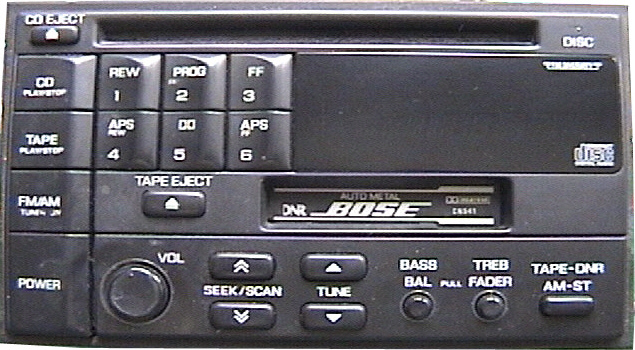 Now you can access the side screws to unbolt the stereo. These screws are tight so you want to be able to leave the TEMP controls hooked in the car, put the stereo on a table to work at removing these tight screws. If the side screws that hold the bracket to the stereo are too tight, you can leave the brackets on and take the TEMP controls out of the brackets to leave those controls in the vehicle. The section above the stereo that holds the vents does pop out. Move around the top gently with straight edge screwdriver. Move slowly and do not use excessive force, work around gently and you can get it to come out. Do not try to go between the top section and the bottom section as it is not necessary and may scratch. Once the top portion comes out, you will see the 2 screws that hold the top corners of the bottom piece, at the top, that were behind the vents. 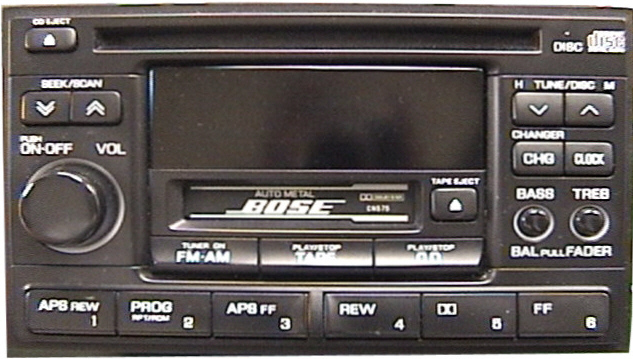 Remove those 2 screws and the rest of the dash piece that surrounds the stereo will snap off. Then you can see the 4 bolts that hold the stereo brackets in. These are removed by pulling out the ashtray which exposes the 2 screws that need to be removed. 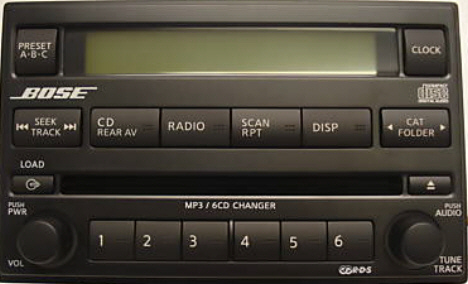 Then the plastic that goes around the stereo will unsnap. 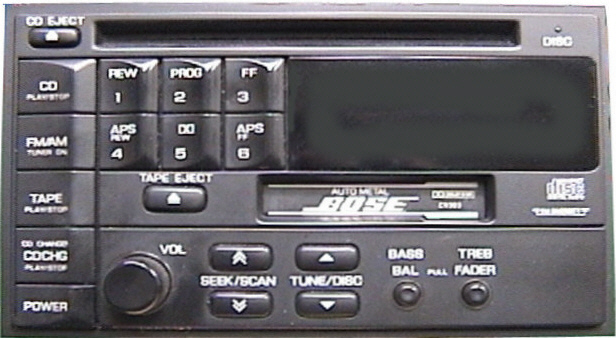 The screws then can be seen that hold the stereo in and the stereo just unplugs. These are removed by pulling out the box up top of the stereo on the bash, right in the middle (snaps out. Then the portion that goes around the stereo will unsnap off which exposes the screws. There are 2 screws along bottom edge of panel that goes around stereo. Once the 2 screws have been removed, the panel will pull off and unsnap along top. Then unplug lighter to move it left enough to pull stereo out. See above left photo: Top vents and the plastic piece that is below the vents that holds the clock and switches all come out in one piece (not including the AC controls but right above AC controls). What we do here is use a regular screwdriver and gently pry out right where the bend is between the vents and the lower part. You can use 2 screwdrivers, one for each side or work both sides out with 1. Once it is forced out a little bit, it will unsnap and be loose. For now, that is all there is to do on the top to see the 2 bolts that hold the top of the radio bracket, on top behind the AC control panel (2 10mm bolts). The same 2 bolts are on the bottom behind the lighter and ashtray. Start by removing the piece that goes around the shifter. It pry's straight up to unsnap and then has feet holding the top edge on each side of the ashtray. With that up, unplug the lighter by squeeze and pull off connector in back, Next, move the ashtray by removing the one phillips screw on it's left side ear tab, then we use the screwdriver on the right side of the ashtray and force it out so the snap that is in the back on right side unsnaps, once loose unplug the little connector and move aside. Now you can see the bottom bolts and once they are removed, the stereo and AC controls all come out together. It is best to unplug everything so you can have the whole unit on the table in order to remove the stereo from this bracket. Start by turning key on and pulling into gear. (not running with emergency brake on) Then the plastic piece that goes around the shifter will pop up and off, pry on the side closest to you. Then pull out the ashtray and notice there are 4 screws that hold that piece that goes around the stereo, 2 above stereo under edge and 2 along bottom near ashtray, the left one is hidden but directly left of the one you can see. With the 4 screws removed then that piece will unsnap from around the stereo, snaps along the top. Pull away enough to see the connector to the hazards switch and you can unplug it. Also there is a black rubber hose below the switch that you can pull off. Now, the dash piece will move more but it is tricky to get the bottom part out from the bottom, you have to kind of help the lighter socket wiring get past the solid dash piece that stops it. Usually now there is enough room to unscrew the 4 screws that hold the stereo in, and unplug it to maneuver it out of there. remember to plug the hazard switch back up so your blinkers will work while stereo is out. Also, the brackets on the side of these stereos are very tight, it's OK to just leave them on the unit when sent in. We only need the amp circuit boards to rebuild them. You can pull the boards out of the black plastic box from the trunk side. There is 3 deep holes in the box and they have Phillips screws in them. Remove these 3 screws and pull that lid off. Then there are 2 screws that hold the circuit board in and as long as there is a plug for the 6 wires that go into the board, then just unplug it and it can be sent for rear speaker rebuild. If there is no plug, then the whole assembly will have to be taken out from the top. See direction for taking out the back seat below. On some of these, if there isn't a plug to unplug the circuit board from the rear speaker, then the rear seat has to be moved in order to pull speakers out. The plug makes the job simple, if no plug then it's not so easy and you may want to consider having a mechanic remove them. In order to access the rear speakers, you must first remove the backrest of the rear seat. There are 2 10mm bolts on driver side and passenger side, in the crack of the seat, that hold each bottom corner of the backrest down. Once removed, you can pull out and push up on the backrest to slide off hooks along top rear of backrest. Once that's out of your way, there are 2 plastic screws and screw holders that hold the brake light in place, remove the brake light and it unplugs. Also remove the metal bracket that held the light. Along the rear window on the inside, the plastic long pieces will snap up and off with a regular screwdriver. The whole panel now that holds the speaker grills will snap up, look from the trunk, you can see the large plastic snaps (green) that stick out by the speaker, you can help them unsnap from the bottom by squeezing them with needle nose. Move the whole piece to get to the 2 speakers, each has 3 gold nuts to loosen to remove from below. In order to access the front speakers, you must loosen the door panels so you can pull the bottom of the panel out and reach under it to unscrew the 4 Phillips Hex Bolts that hold in the Black plastic speaker housing . Start by using a flat head screwdriver and remove the following screw covers. 2 Quarter size plugs along the front end of the panel - towards the front of the car from the door handle. Those 2 screws will come out. Where the inside latch is, there is a black plastic piece on the rear side of the latch. It has a cut out area for you to pry to pop that piece out - use a light to see it clearly. Behind it is 2 screws that need to come out. Also, on the top of the leather handle that you pull the door shut with, there is a nickel size plug that comes out so you can access the screw in the top of the handle. That screw needs to come out. The driver side has an extra screw that is visible only after the long plastic piece with power windows on it has been popped up and out. It has latches on front, middle, and back ends of it. The screw under it will need to come out. Now, slide a screwdriver between the door panel and the doorframe, and pry to release the plasic snaps. Do this all of the way around the door. Now the door panel can be pulled out far enough for you to get to the speaker housing 4 screws and it unplugs from where the wiring goes into the housing - squeeze to release the connector. That housing can be sent as is in for repair. Front Door Speakers: The door panel has to be taken loose and pulled out from the bottom in order to lay under door and unscrew speaker's black housing. Remove the 3 screws that hold the plastic piece around the seat belt, remove the 2 screws on the plastic piece around the seat belt along the bottom edge of the door. Remove the screw in the bottom of the handle on the armrest (under the cloth piece). Remove the screw in the leather handle that you pull the door shut with. Remove the screws in and around the door handle. The door will unsnap along the bottom edge by laying down and looking for where the snap is and use a regular screwdriver to pry it loose. If you pull on the panel, many times it will break the snaps off of the panel so use screwdriver. 4 screws hold in the speaker housing, 3 are easy to get to and the 4rth is at the very top and can only get to it with a short Phillips with the door panel swung out to 45 degree angle. Once unscrewed, they unplug. ONLY SHIP BLACK PLASTIC HOUSINGS THAT HAVE THE SPEAKER IN IT WITH CARDBOARD TAPED A CROSSED THE SPEAKER CONE TO PROTECT IT. The entire rear area lining has to come out in order to get the 2 rear speaker housings out. Start with pulling up and out the roller shade. It's brackets will have to come out 1 screw each side. Then beginning at the middle in the back, where the latch is, undo the 2 thumb screws and fold towards the front, the carpet so you can see the bolts that hold the lining plastic pieces in. Snap out the little doors on each side where you can access tail lights (bolt behind little door). Work your way towards the speaker removing bolts and screws to be able to take out the screws that hold the speaker housing in. The only thing you need to do is get the speakers and radio out of the car to send in. There are tips on the Nissan Page of our website for you or your mechanic. We don't take rear speakers out. We just remove amp circuit board from box on side of speaker from inside the trunk; we just need the boards, The fronts ship as an assembly. Tape cardboard across the speaker cone if not protected when shipping them. Sending just amp PCB's is OK too if they unplug, some of the 89's are hardwired to the speaker (or really just hardwired to the harness) some of them have a connector to the PCB amp board which makes it quicker. That info is in regard to the rears. Be sure to look over the Nissan Page on the website for removing tips. "I'm sending this note to commend your company for the excellent job you did restoring my Bose sound system! 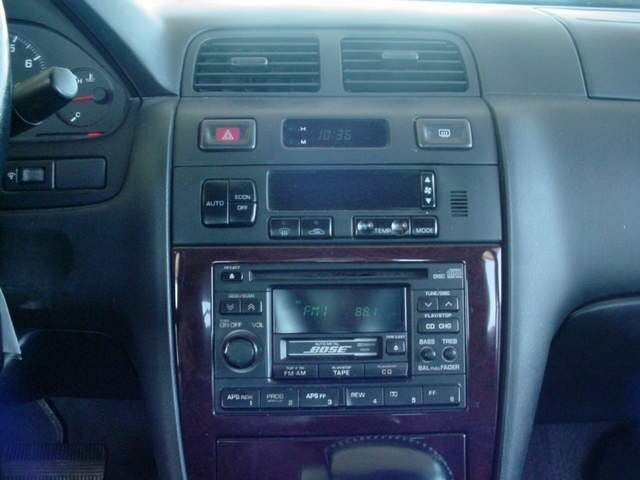 I contacted at least 5 other car stereo companies and no one was as knowledgeable or could explain to me in an understandable way what I needed to do, including the Infiniti Dealer! I honestly believe the system sounds better than when it was new! Please use me as a reference, if you wish, and thanks for the excellent job!" "Walter Ainsworth","1992","Infinity","Q45"